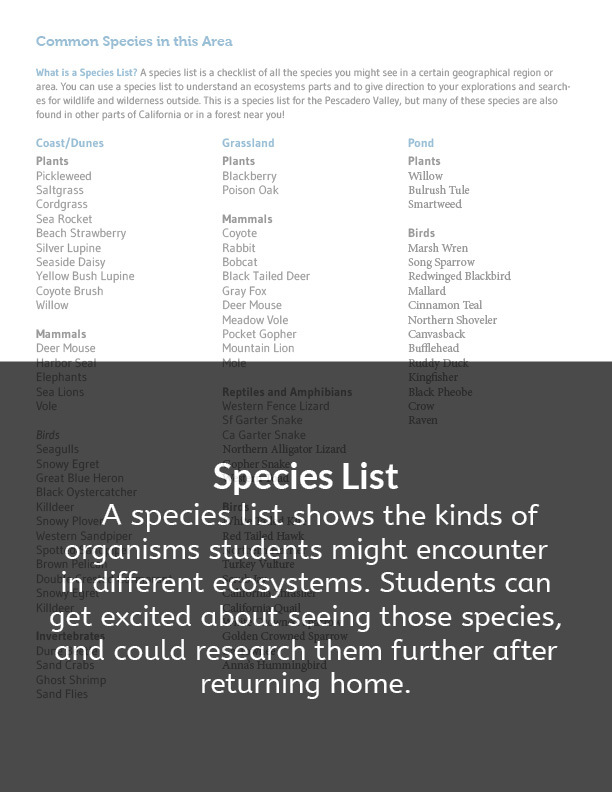 Scientists and naturalists in almost every discipline use field journals to record observations, data, questions, and thoughts through drawing and writing. 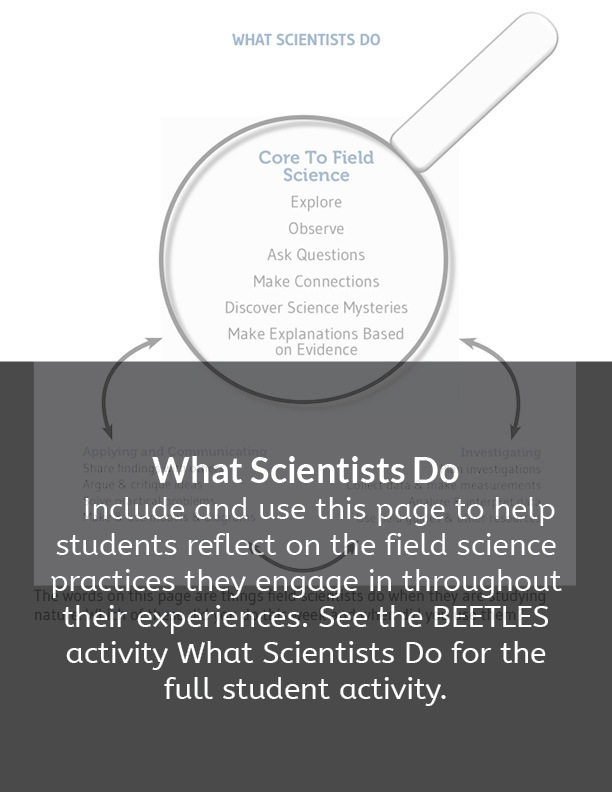 Journaling in the tradition of field scientists and naturalists can help students maximize their learning and engagement with nature through participation in an authentic scientific task. 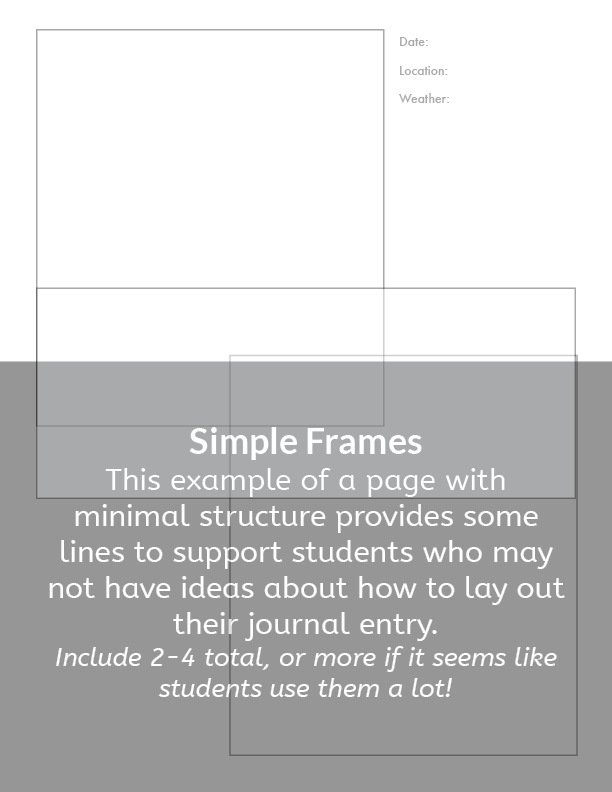 When students draw and write in their journals, they deepen their ability to observe, think, and remember. 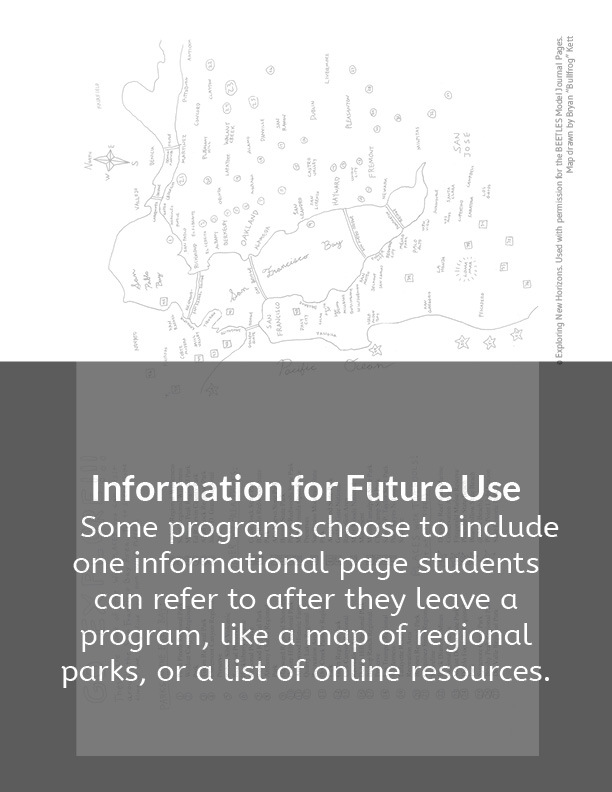 Many programs choose to print journals, partly for cost effectiveness and partly because a customized, printed journal can include information, resources, and structured activities for students. 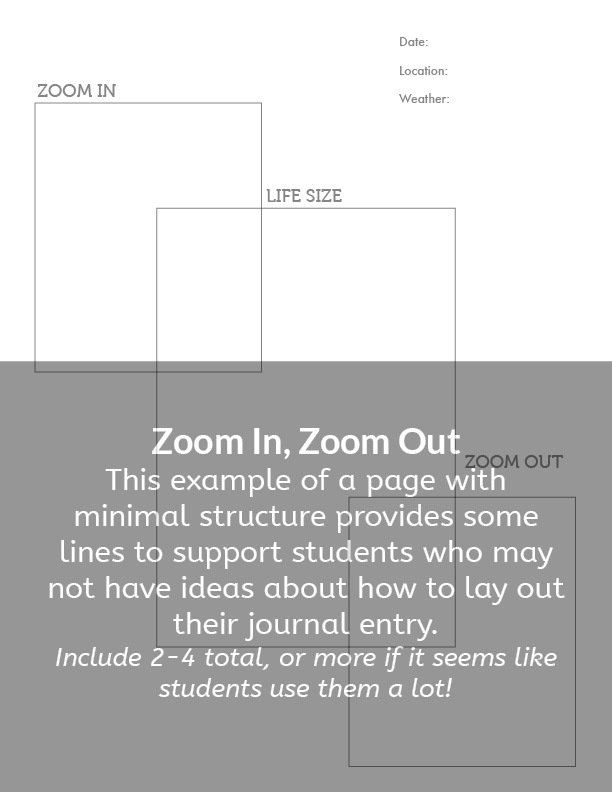 The resulting outcome, though, is often journals so full of printed information and worksheets that there is little or no space left for students’ own writing, drawing, reflections, and thoughts (actual journaling!). 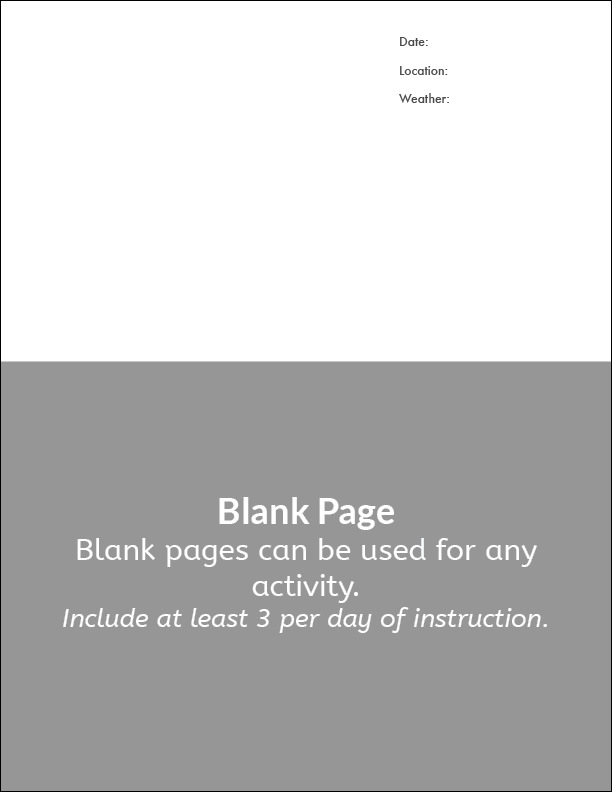 What do you do with blank pages?? 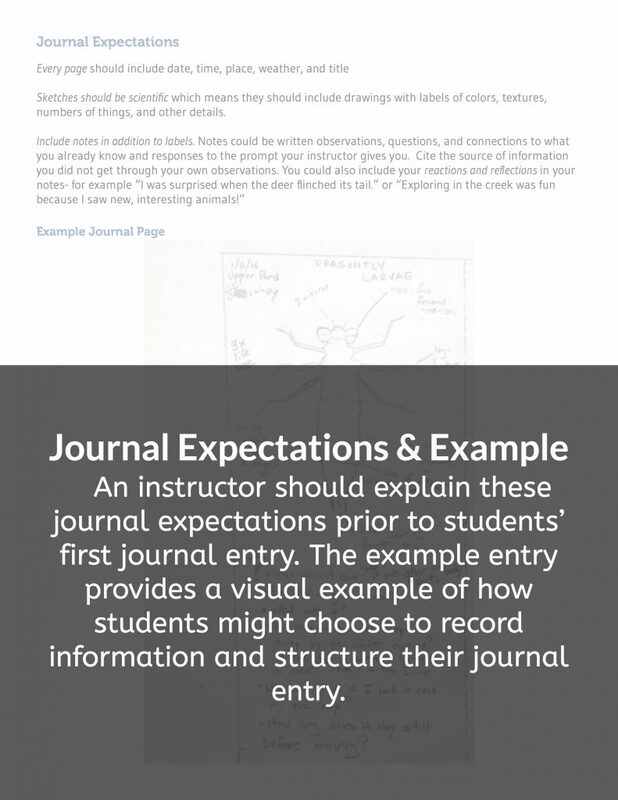 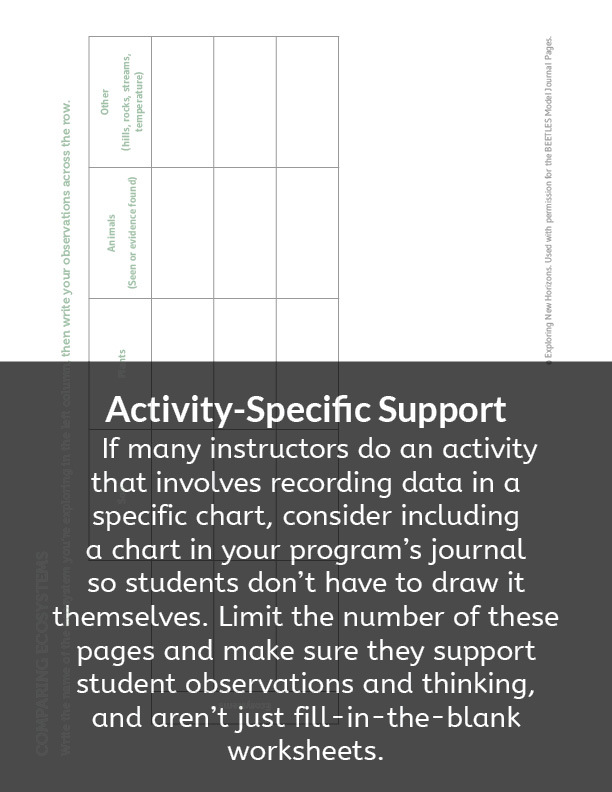 For productive student journaling, you need more than a great journal–you also need instructors who know how to effectively guide students in journaling. 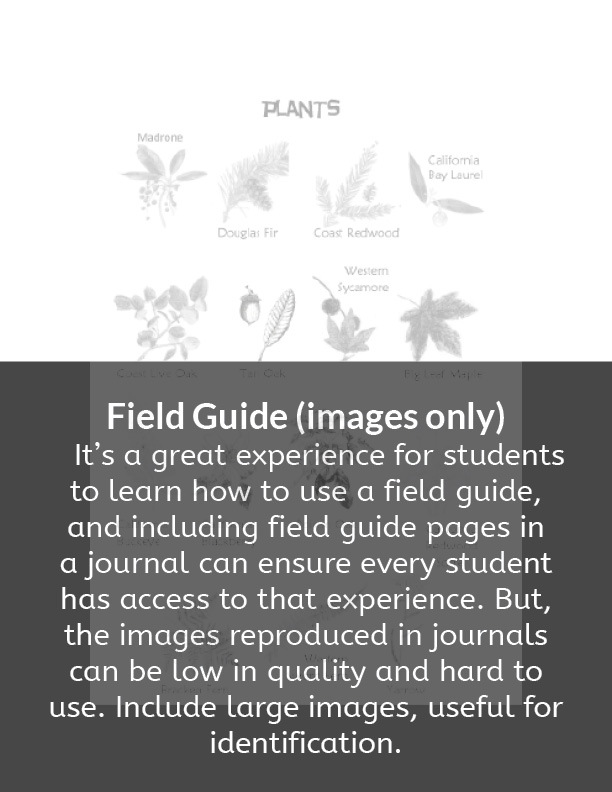 For best practices in using journals to support student learning, see- the BEETLES session Field Journaling With Students, the curriculum Opening the World Through Nature Journaling, and The Laws Guide To Nature Drawing and Journaling (especially the section “Projects to Focus Awareness”). 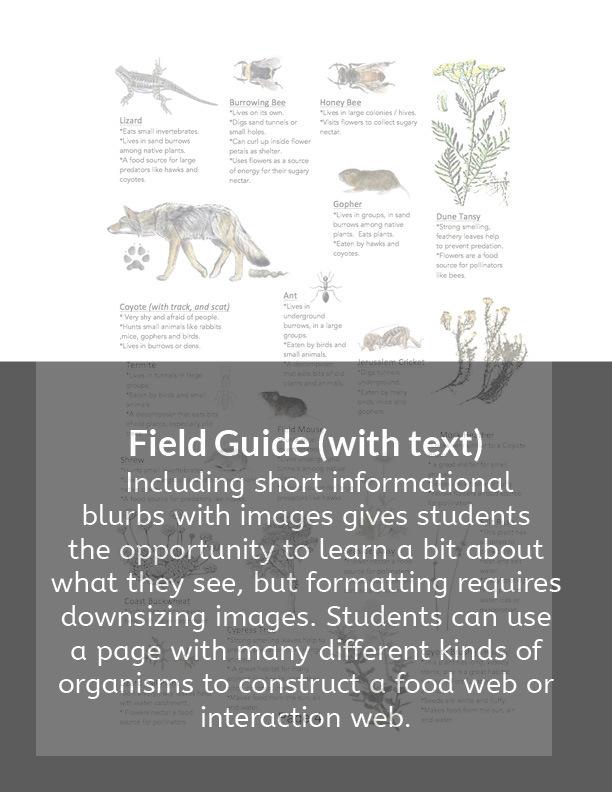 Click to view and download PDFs without captions. 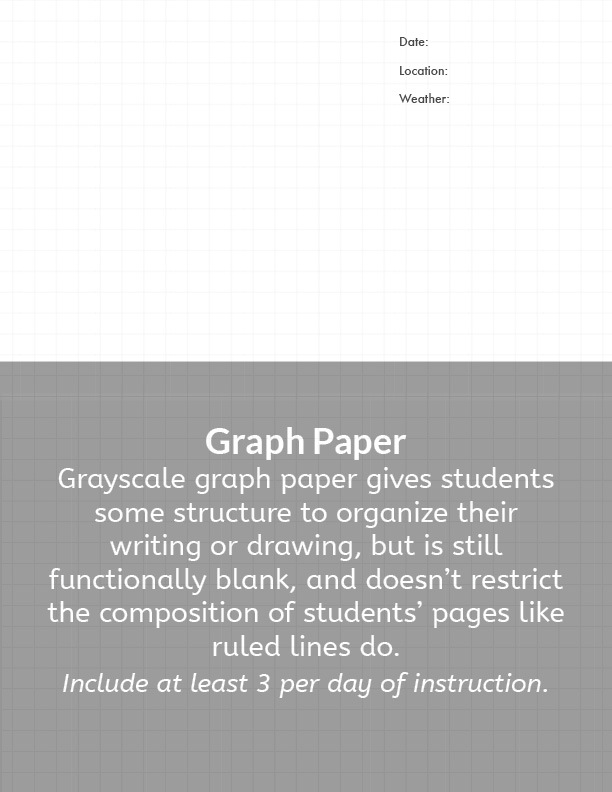 Click arrows to scroll right and left. 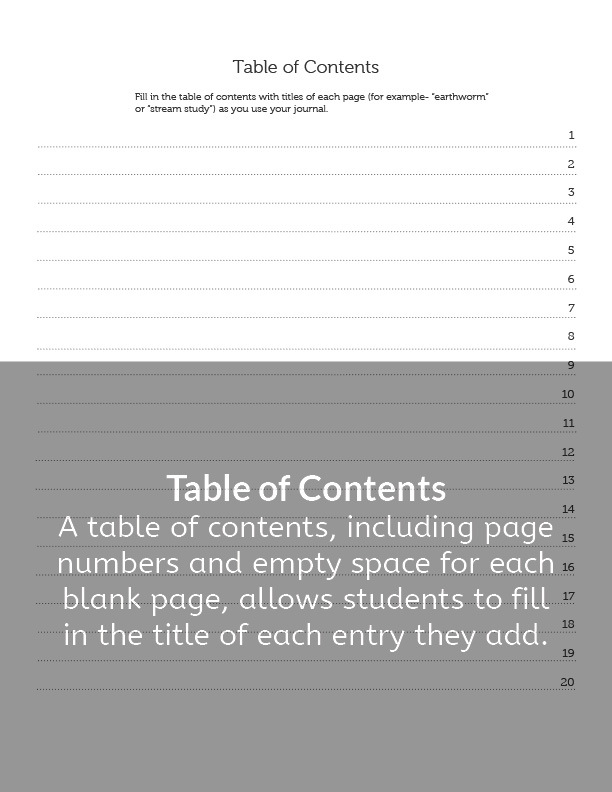 Note: There are intentionally no word searches, crosswords, worksheets, or long blocks of text included here. 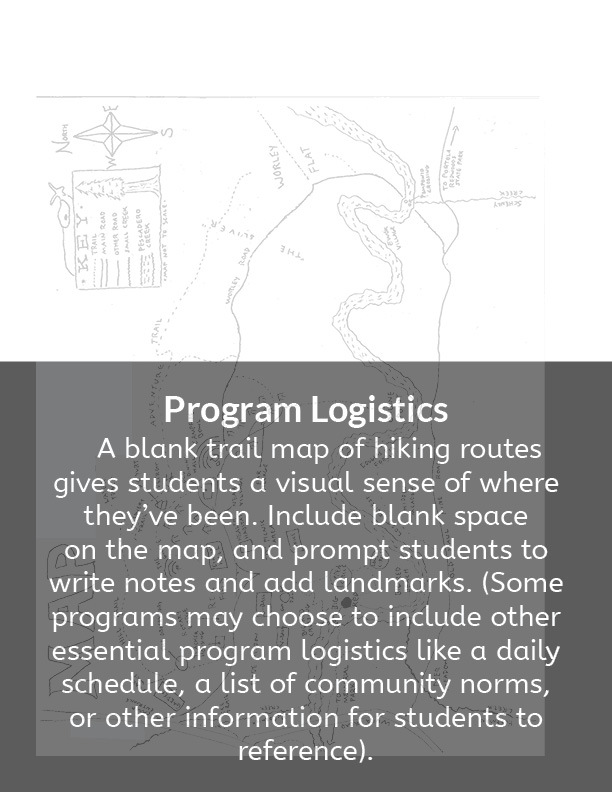 Though such “time fillers” can be used to give students something to focus on during free moments, they distract students from the opportunity to engage with nature thoughtfully, or with each other. 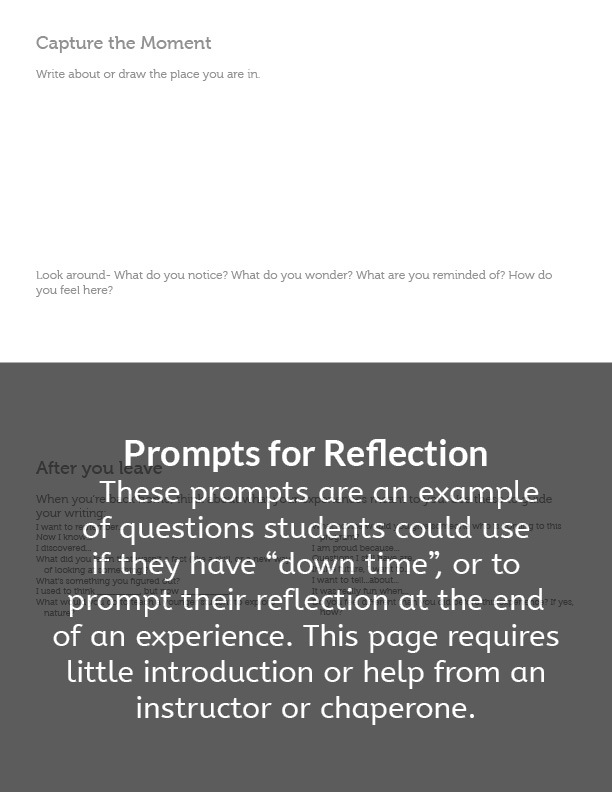 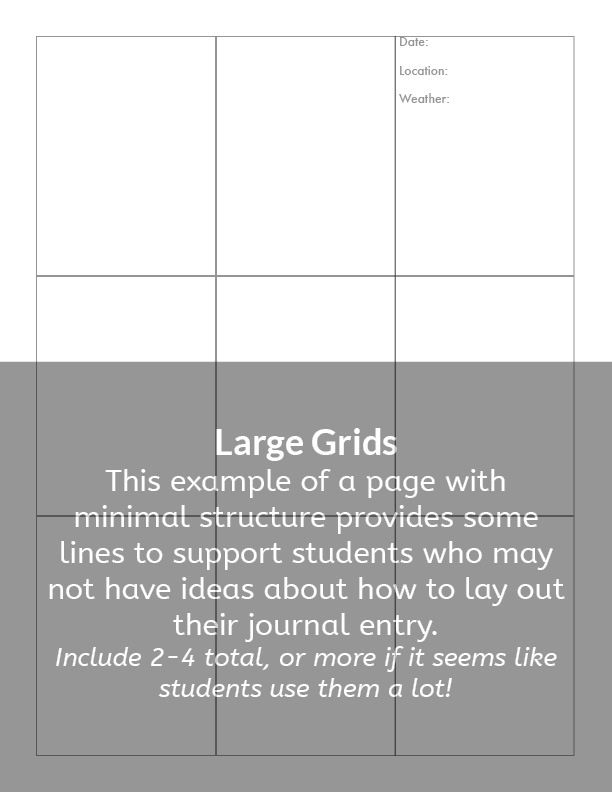 Instead, we suggest including pages with space for reflection (example below), which can be used with minimal directions from an instructor.